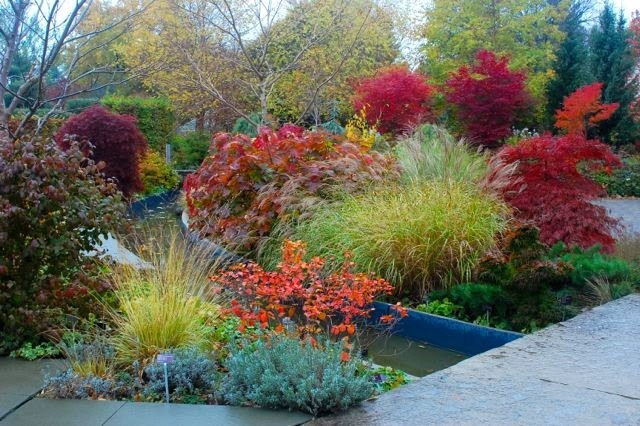 Think November is drab? It doesn’t have to be, if you play your cards right. Look at the lusciousness in the photo above, without the use of a single flower – well, discounting the dried heads of a red-tinged oakleaf hydrangea (Hydrangea quercifolia) in the centre of the shot. 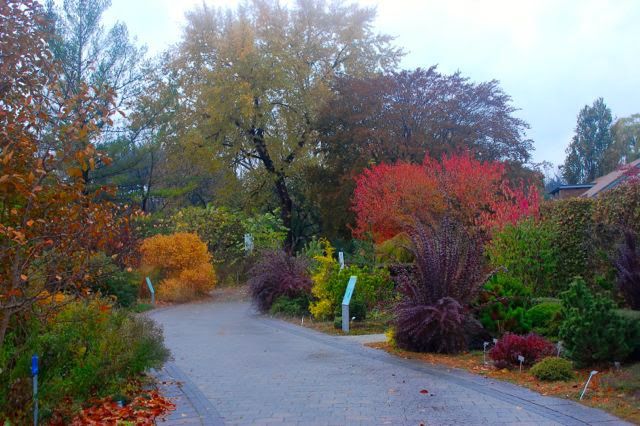 The bright orange-red shrub in the foreground is Fothergilla. Japanese maples (Acer spp) skirt the background, and the plummy shrub on the left is a Viburnum, some of which colour up even more dramatically. 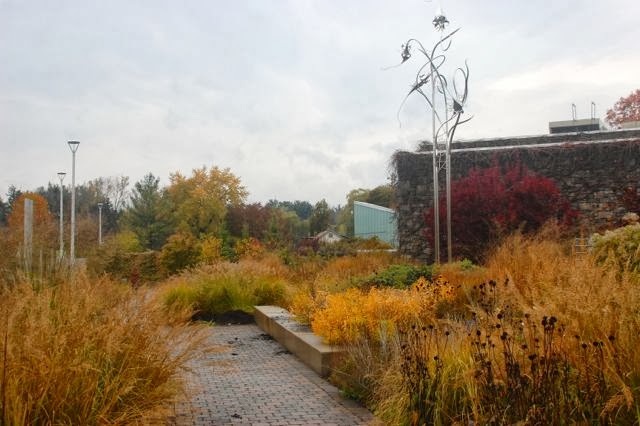 It’s all accented by blue-green lavender (Lavandula), dark evergreens and goldy grasses. Who needs flowers in our gardens, if we can have fall colours and compositions like these? Grasses and perennials with fall colour, such as threadleaf bluestar (Amsonia hubrichtii), can give the garden a golden glow. 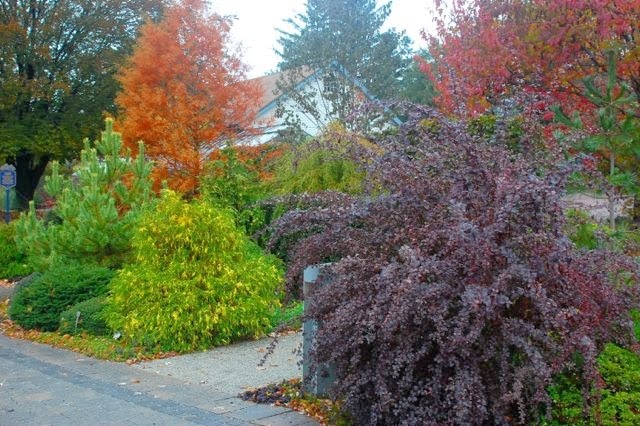 Don’t forget dark foliage plants – here, some purple-leaf Japanese barberry (Berberis thunbergii) – which can be overlaid with red or gold. If you don’t like barberry, then try our native ninebark (Physocarpus) in one of its many deep shades. The buff tree at left is a deciduous conifer before its needles drop, the native baldcypress (Taxodium distychum). In front is a gold-variegated evergreen (perhaps Chamaecyparis – someone will set me straight). Note the all-gold one in the shot below. The purple and orange-red at the centre here are berries – beautyberry (Callicarpa dichtoma ‘Early Amethyst’) and orange and red forms of winterberry (Ilex verticillata). All native North Americans. [Oops: Only the Ilex is; Callicarpa americana is the native species.] I couldn’t find tags for the latter. 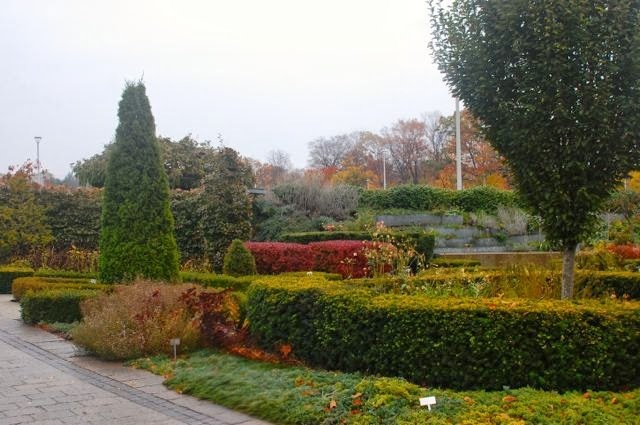 Then there’s the anchoring dark green of evergreens, with a pop of red in that hedge of burning bush (Euonymus alata). Add colours like these to your garden paintbox, and you won’t miss the flowers. I’ll be writing a separate post on fall berries, while you have time to notice them in gardens around town. But add your thoughts here – what are your favourite ways to add colour in the absence of flowers? Stunning pictures: show you why you shouldn't discount fall. It's one of the most attractive times of the year. I agree, Yvonne. I love the colours fall gives us. Glorious shots ! We planted a serviceberry tree this spring and while it's still very small the pinkish gold of the leaves this week is fantastic. It will be a real superstar next fall! My serviceberry (Amelanchier) is looking fabulous right now, too. Autumn is my favourite time at the TBG, time for the woodies to really strut their stuff. You mentioned berries adding colour, I'll chime in with vivid bark, e,g, Cornus sericea spp. Absolutely, when the leaves fall, bark has its own spotlight. I love peeling barks like paperbark maple (Acer griseum) and river birch (Betula nigra). And some of the cherry family has bark with a lovely glossy rust, especially when young. I have never been to the TBG this late in the fall. It is still amazingly beautiful. The TBG is worth a visit in all seasons, Jennifer. 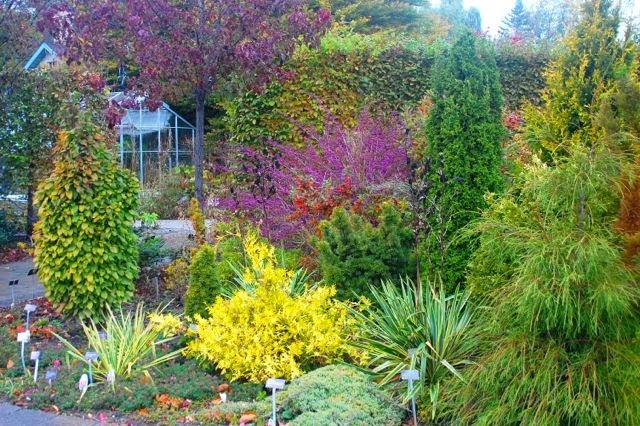 The fall color in that garden is flat out gorgeous. PS Callicarpa dichotoma is a species of Japanese beautyberry. I stand corrected, Sweetbay. Post updated. I try to plan my garden with fall in mind at all times. As much as I love flowers, they don't last very long and I work to try to get interesting foliage to fill in the blanks during the summer and be the showcase in the fall and even winter. 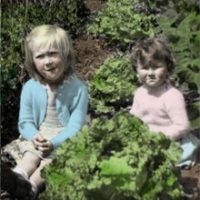 These pictures are absolutely gorgeous and I may steal the planting plan for my backyard next year!! That's what botanical gardens are for! Education and inspiration. And sometimes a little conceptual theft.